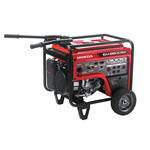 Honda Deluxe Series generators offer the right features for convenient, reliable backup power – during outages and brownouts. Features include a heavy-duty full frame for added protection, voltage regulation for continuous stable power, wide handles for easy transporting, multiple front panel outlets for easy power connections and electric start. The EM4000, EM5000 and EM6500 generators feature simultaneous AC/DC use, fuel gauges and large 6.2-gallon fuel tanks for hours of continuous operation. All of them are powered by the new, technologically-advanced commercial-grade iGX Engines and include the all-new iAVR power feature which minimizes voltage fluctuations and allows for increased wattage above the maximum rating for up to 10 seconds to start high amp load applications. Adding up to quiet, durable and efficient power like you’ve never experienced. 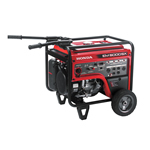 The EM5000is model adds Honda’s advanced Inverter Technology to the mix – providing quieter operation with clean power in a smaller, lighter-weight package.